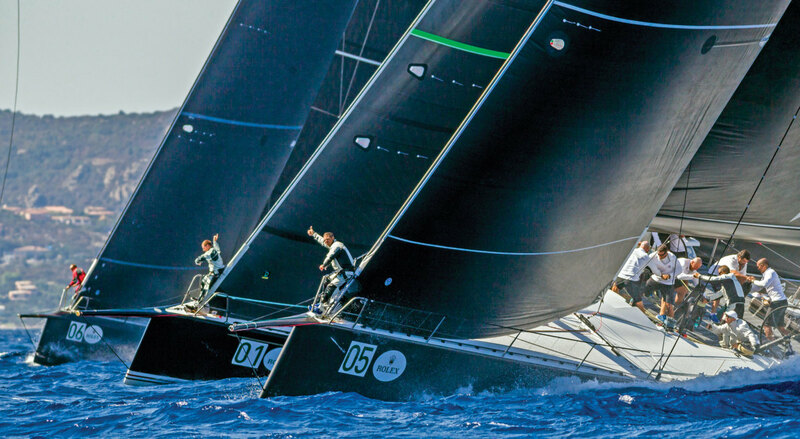 Time was that massive racing monohulls represented the cutting edge of yacht design. The famed schooner America, with her radical lines and sails, set the example for subsequent America’s Cups through to the 1930s, the era of the magnificent J Class. It was a similar story with the larger “skimming-dish” centerboard schooners of the 1870s. For the better part of a half century following World War II, though, even the biggest racing yachts weren’t that big. 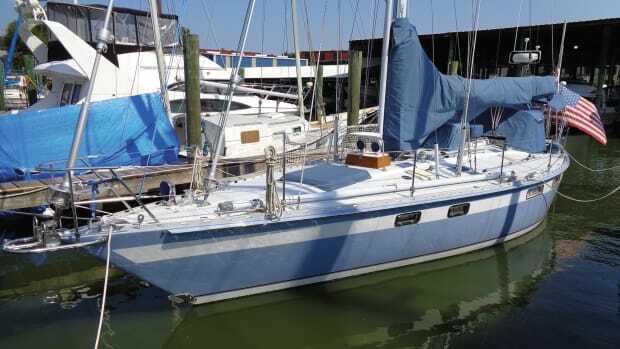 Granted, there were occasional monsters like the 236ft four-master Club Méditerranée, which French legend Alain Colas wrestled singlehanded across the North Atlantic in the 1976 OSTAR. Otherwise, even the biggest boats of the time paled in comparison to their pre-war ancestors. The IOR maxis, for example, which competed in the Whitbread Round the World Race and a handful of inshore events in the 1970s and 1980s had LOAs of 80ft. 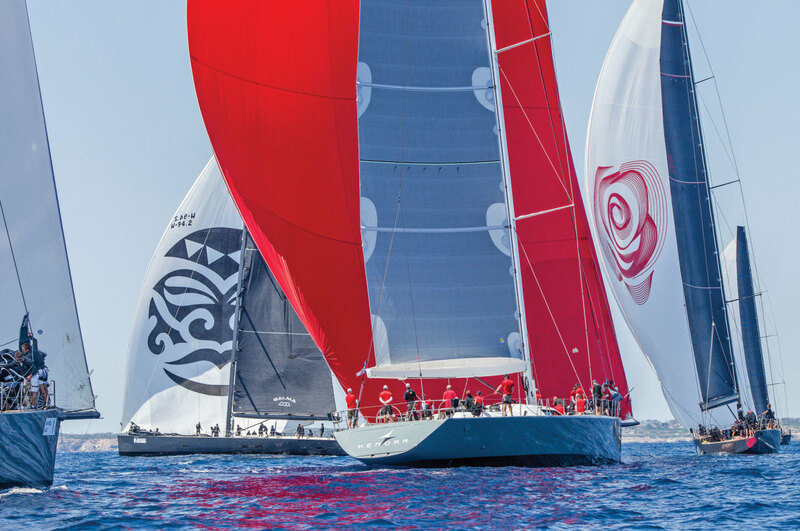 Few of the boats that competed in the resulting International Maxi Association and the first grand prix monohulls (now the Maxi Yacht Rolex Cup) in Porto Cervo—including the ILC/IMS maxis of the 1990s such as Larry Ellison’s Sayonara—exceeded 85ft LOA. All that changed, however, in the last decade, with the arrival of a new class of high-tech maxi racers. Although the biggest of these have been Robert Miller’s 146ft Mari Cha III and the 138ft schooner Mari Cha IV, most of the racing maxis have consolidated at 100ft, after this was deemed the maximum length for entries gunning for line honors in the annual Rolex Sydney Hobart race. This spawned numerous maxis, notably Neville Crichton’s Alfa Romeo and Alfa Romeo II and the late Bob Oatley’s Wild Oats XI. More recently, it has been the very latest generation of maxis that have caused the biggest leap in performance, including Jim Clark and Kristy Hinze-Clark’s 100ft Comanche, designed by French naval architects VPLP and Guillaume Verdier. 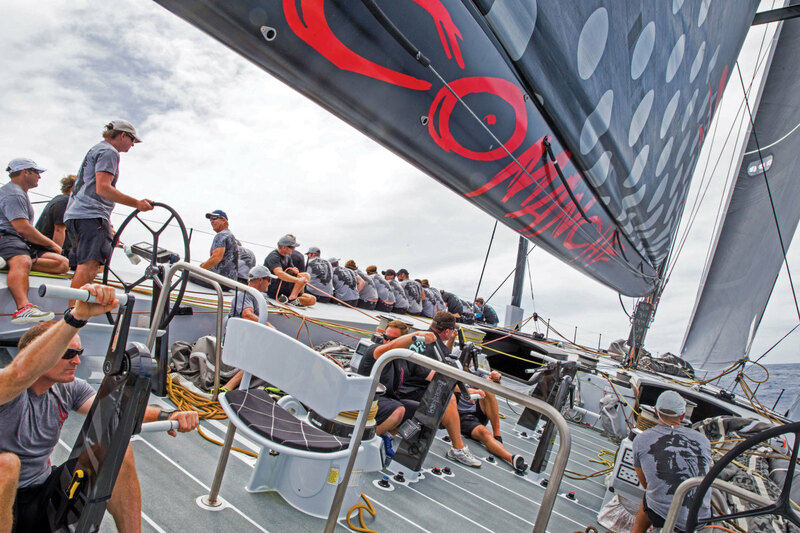 Last summer, for example, during the Transatlantic Race, Comanche set a new monohull 24-hour record, covering 618.01 nautical miles at an average speed of 25.75 knots. 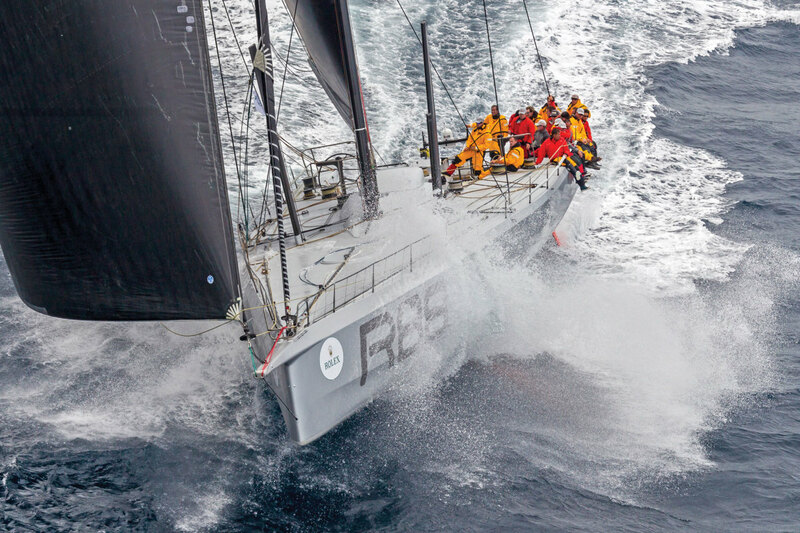 This bettered the record of 596.6 miles set seven years previously by the Volvo Ocean 70 Ericsson 4. 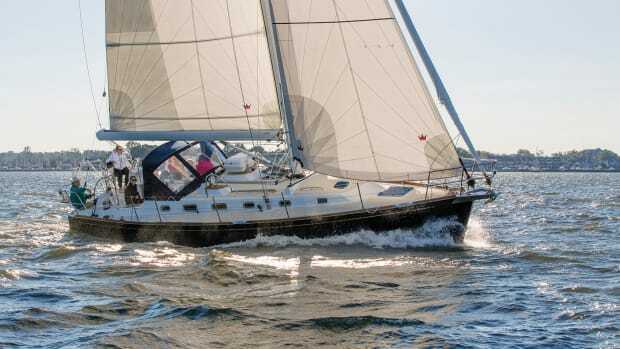 Since Comanche’s launch from Hodgdon Yachts in Maine in September 2014, the boat has mixed it up on racecourses around the world, most notably with the aforementioned Wild Oats XI and with George David’s smaller Rambler 88, a design from Juan Kouyoumdjian, built by New England Boatworks in Rhode Island. 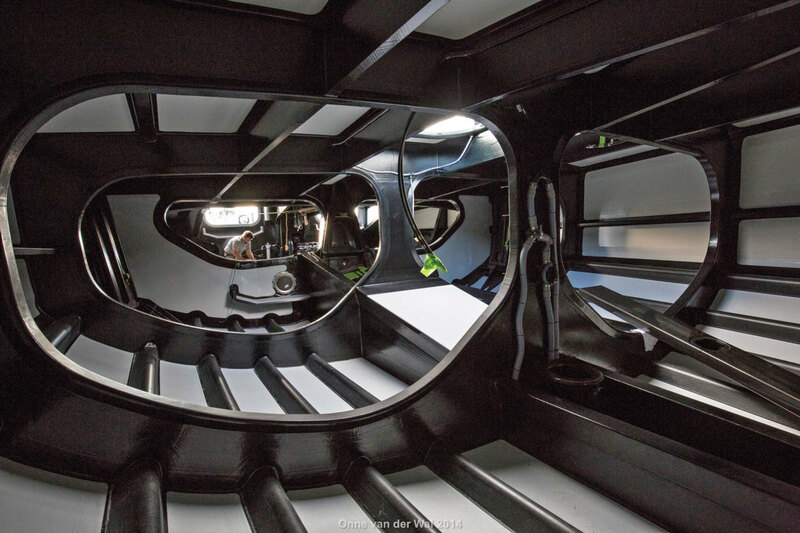 Comanche’s designers are best known for designing the last Vendée Globe-winning IMOCA 60, while Juan K. is renowned, among other things, for his race-winning Volvo Open 70s. However, the two boats have quite different functions—Rambler 88 was designed to be a maxi-boat winner on handicap, while Comanche is gunning principally for various offshore records and line-honors glory. 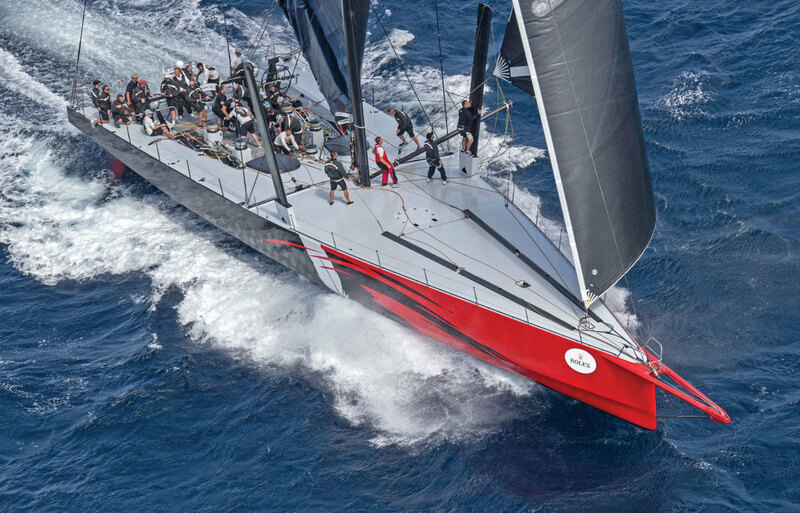 Comanche achieved this most recently in the last running of the Rolex Sydney Hobart race, seeing off all of the powerful (but older) 100ft fleet. The boat’s nav station is all business. Photo courtesy of Rolex SA. That the latest boats are such a significant step forward is principally down to their weight, maintains North Sails President Ken Read, who skippers Comanche. Compared to George David’s previous Rambler 100, which Read also used to sail, Comanche has similar righting moment (including her canting keel and six tons of movable water ballast) and sail area, but is four to five tons lighter, weighing in at “31 tons and change.” According to Read, this weight saving has come about through “superb engineering” by her French creators, and her having a massive 22ft 4in draft, allowing a lighter bulb to be fitted. To enable the boat to achieve maximum performance, it is essential to keep her bow up to avoid driving into the the backs of waves, so the rig is stepped around 60 percent of way aft from the bow. The pin about which her keel cants is also inclined, so that when the keel is canted to weather, it further encourages her bow-out attitude. With the president of North Sails aboard, obviously the sails are “special,” and Comanche is fitted with North’s latest carbon 3Di RAW sails, to reduce weight afloat.  “For me Comanche is not a monohull, it’s a multihull,” notes Read. 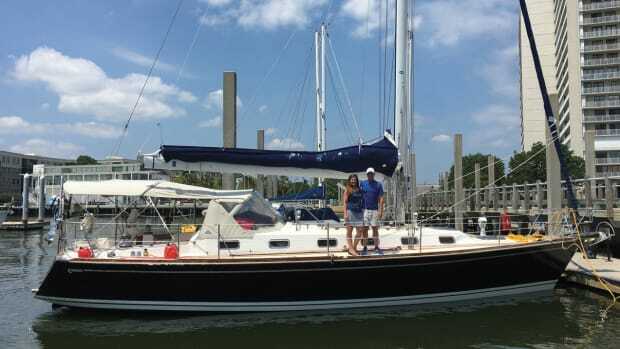 “This boat actually goes fast enough to use multihull sails downwind now. The lighter we get this thing the more the apparent wind’s going forward downwind and the flatter the downwind sails are getting—it’s just incredible.” In other words, at least in terms of apparent wind angles, Comanche is almost never sailing downwind. This year Comanche is set to make an attempt at the west-to-east transatlantic record, which currently stands at 6 days 17 hours 52 minutes and 39 seconds, as set by Mari Cha IV in 2003. Given that Mari Cha IV’s fastest-ever 24 hour run was only 525 miles—almost 100 miles less than Comanche’s—Comanche should easily beat her record. Plus, Read still believes they haven’t seen Comanche’s top performance yet. 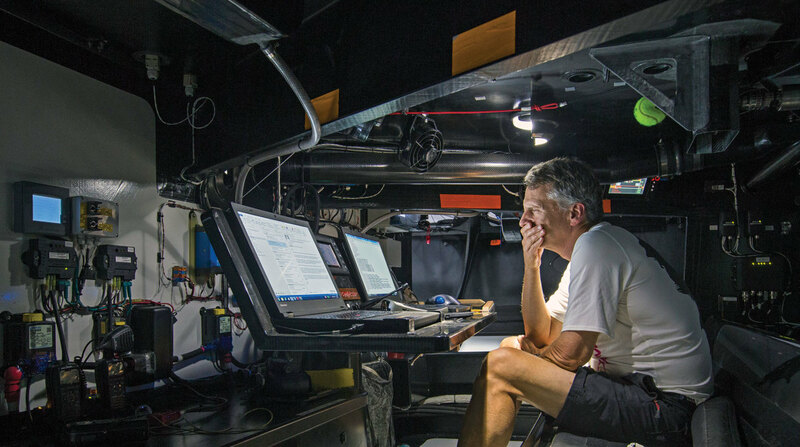 “We think we can go 2 knots faster—40 or 50 miles a day,” he says. For this she would require optimum conditions—roughly 30 knots from a 125-degree true wind angle. Impressive stuff! [advertisement]Still, while the new grand prix maxis may be stealing the limelight, they are not the only new boats of this size to be hitting the racecourse recently. 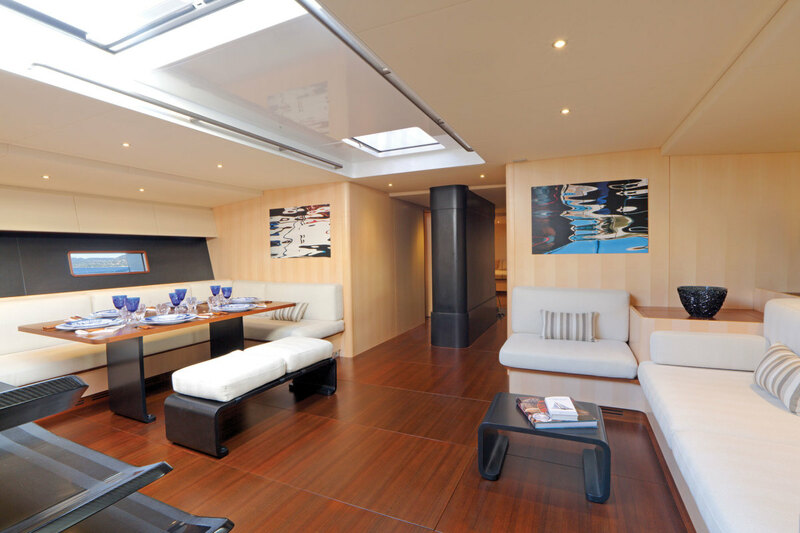 Wally Yachts, for example, have long been trend setters with their sleek, fast cruisers. 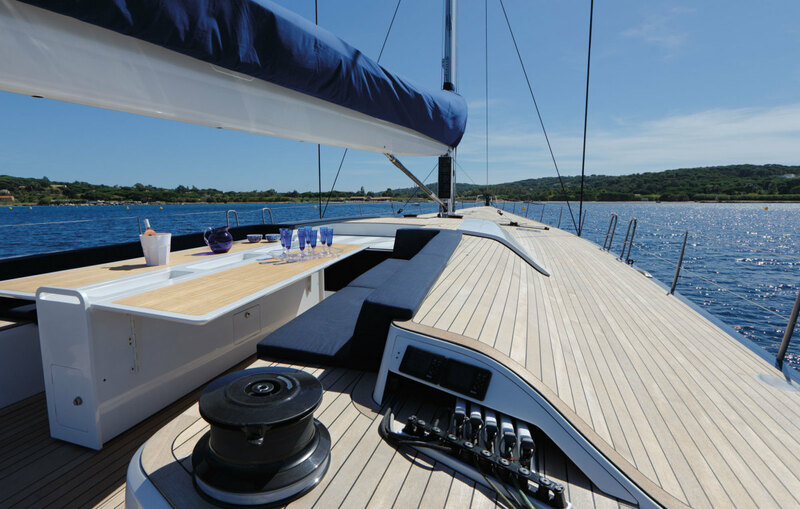 However, in 2011, in the face of demand from owners, they came up with a ‘WallyCento” box rule to create a new generation of 100ft luxury racer-cruisers. 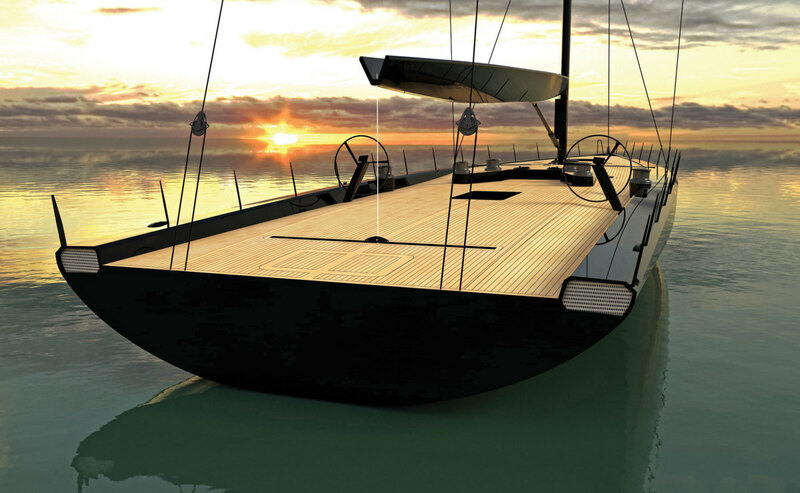 These would have many of the go-faster features of a race boat, such as carbon fibre construction, high-tech rig and state of the art sails, while retaining a luxurious interior. Impressively, three WallyCentos have already been launched—Magic Carpet³, built for former head of L’Oreal, Sir Lindsay Owen-Jones; Hamilton, for British owner Sir Charles Dunstone, the founder of Carphone Warehouse (which has since sold to former Bugatti boss, the German Thomas Bscher, lengthened, and renamed Open Season); and Galateia, an update on Magic Carpet³, which was designed by Reichel/Pugh. 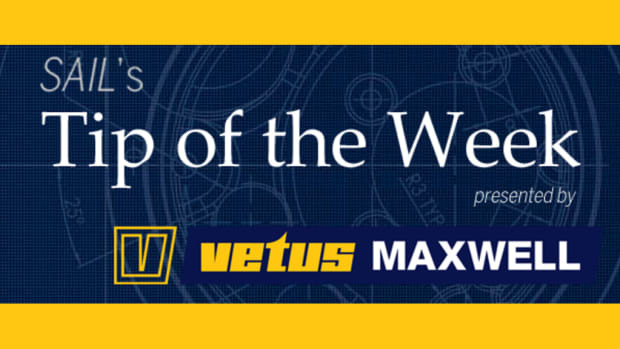 “Our approach to the WallyCento rule has been to make it more of a racing-orientated boat in terms of its systems and the sail handling, and making the performance side higher than what the standard Wally has been in the past, probably sacrificing some interior space for a little bit more performance,” explains Bob Wylie, who was project manager for the builds of Magic Carpet³ and Galateia. At 50 tons, the WallyCentos can’t achieve the high reaching speeds of the true grand prix boats. As Wylie describes it, it is more displacement sailing. “Upwind you can lock them in quite nicely. In a breeze they do 12.5 to 12.8 knots. Downwind, you don’t get the high-end surges that the Comanches and Ramblers get. You just get some nice steady numbers.” Despite this, they have still hit 26 knots on Magic Carpet³. 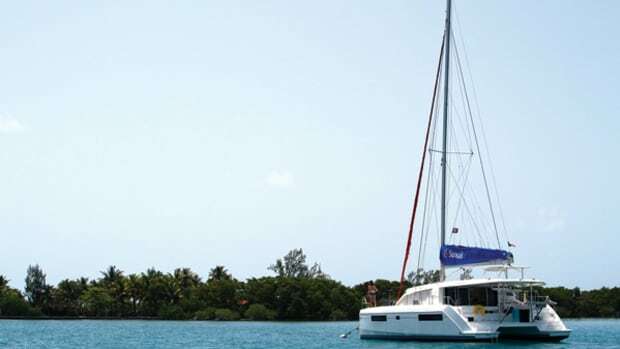 Like most maxi boats, the WallyCentos are typically sailed by a small army for crew, with 24 on board (including owner’s guests) to get them around an inshore course. And of course they are much more at home racing around Porto Cervo or St. Tropez rather than crossing the Atlantic. 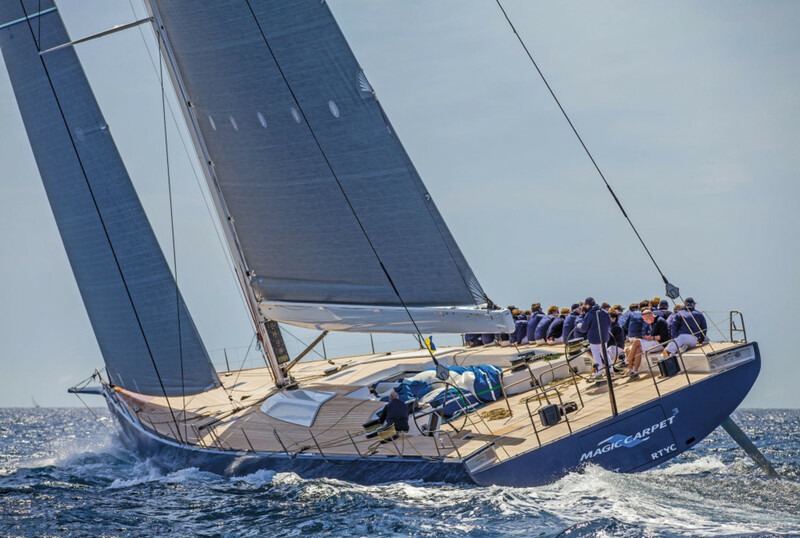 That said, last year Magic Carpet³ did manage to win the Giraglia Rolex Cup offshore race from St. Tropez to Genoa via the Giraglia Rock off northern Corsica. Impressively, a fourth WallyCento, Tango, is currently in build for the owner of another Wally. 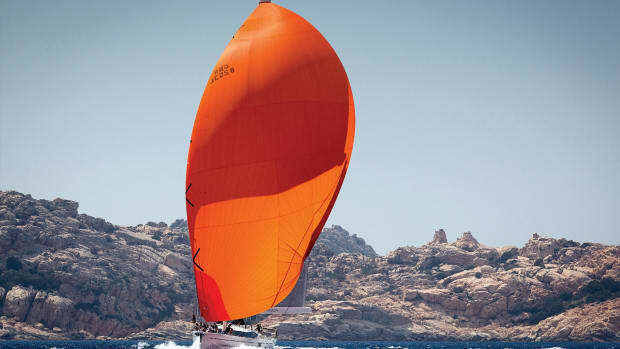 While the first examples have been designed by Judel-Vrolijk or Reichel-Pugh, the latest boat is from Ireland-based American Mark Mills, who designed Alegre, the World Championship winning Maxi 72 in 2014. And allegedly there are more potential WallyCento owners on the verge of signing up. Have these people not heard that there’s a recession on? Maxi racing is overseen by the International Maxi Association (IMA—internationalmaxiassociation.com) and in 2016 will include a circuit made up of the Gaastra PalmaVela in Palma de Mallorca, the Volcano Race in Italy, Giraglia Rolex Cup from St. Tropez to Genoa, the Maxi Yacht Rolex Cup and Maxi 72 Rolex World Championship in Porto Cervo, the Rolex Middle Sea Race and the RORC and IMA Transatlantic Race. Although there are plenty of pros aboard, the owners do the driving. So numerous have the big boats become there are now multiple classes of Maxis to help people keep them straight and organize them on the racecourse. Note that the Mini Maxis include the Maxi 72 development class, featuring thoroughbreds like Hap Fauth’s U.S.-flagged Bella Mente. 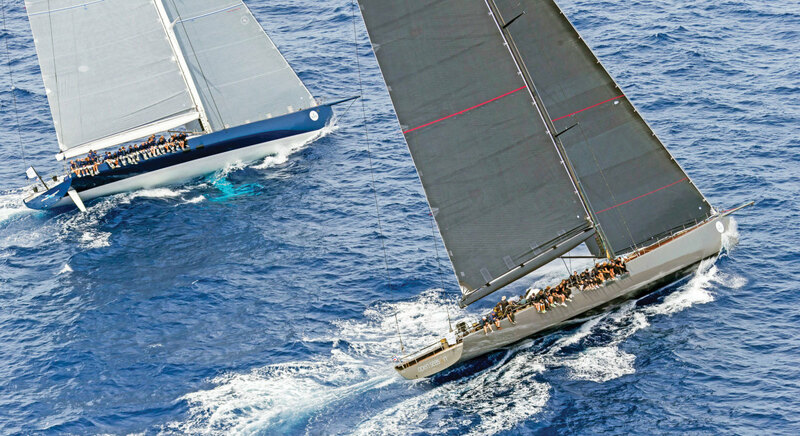 Other regattas that draw today’s cutting-edge maxis include the RORCCaribbean 600, Les Voiles de Saint Barths, the New York Yacht Club Annual Regatta and the Newport-Bermuda Race. Based in London, England, James Boyd has been writing about yacht racing for more than three decades. 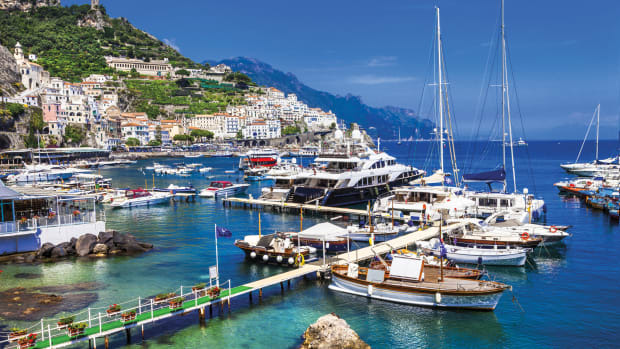 He is a past sailing correspondent of the Daily Telegraph newspaper and editor at Yachting World magazine. He currently runs thedailysail.com.